The 2017 Ford F-350 from South Bay Ford Commercial is a super strong pickup truck. 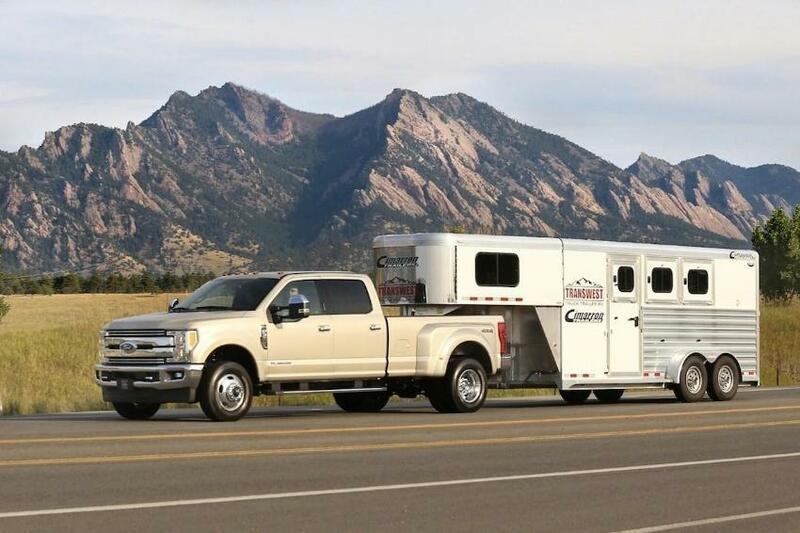 The F-350 also provides best-in-class towing capability. The 2017 F-350 pickup is an extra-heavy-duty version of the popular Ford F-150 pickup. This is borne out by the fact that Ford’s F-Series truck line has been America’s single best-selling line of vehicles line since 1981. It has also held the title of the best-selling pickups since all the way back in 1977. That’s a record that has stood for forty years! If you are searching for a 2017 Ford Super Duty F-350 for sale in Hawthorne, CA, come to South Bay Ford Commercial. We speak heavy-duty trucks! The F-350 has been totally redesigned for 2017. An all-new, stronger fully boxed frame made of 95 percent high-strength steel makes up the sturdy underpinnings of the 2017 F-350. Compared to the previous F-350 frame, it is now up to 24 times stiffer. That is a major improvement! Another huge piece of news concerns the F-350’s body, which was steel in 2016 and is now entirely made up of military-grade aluminum alloy. This provides major weight savings while still delivering a very strong body structure. This innovative new body construction has resulted in a weight savings of 350 pounds, which has allowed many other load-bearing components to be made much stronger. This translates to better hauling and towing capacity than an F-350 has ever been able to offer. What this means to 2017 F-350 users is best-in-class towing capability. The F-350 now has a maximum gooseneck towing capacity of 32,000 lbs., a fifth-wheel towing capacity of 27,500 lbs., and a gross combined weight rating of up to 40,000 lbs. Other 2017 updates include a rear view camera placed in the center high-mounted stop lamp. This gives you excellent visibility into the F-350’s pickup bed. This also helps when hooking up a trailer. The Trailer Reverse Guidance feature makes backing up a trailer much easier. You can even get a camera that can be placed right on your trailer, for superior vision when you are backing it up. Another desirable towing-related F-350 feature is the Blind Spot Information System with trailer tow. This is optimized for trailers that are up to 33 feet long; it utilizes radar sensors in the F-350’s taillights to monitor areas that the driver cannot see. The 2017 Ford F-350 is available in five different trim levels: XL, XLT, Lariat, King Ranch, and Platinum. Ford gives you the choice of luxury-car fancy, work-truck Spartan, or a few levels that split the difference. All Ford F-350 trim levels come as either a 4x2 or a 4x4. Three F-350 cab styles are available regular cab, super cab and crew cab. Options on bed length are 6 3/4 feet and 8 feet long. Some cab styles are not available in all models, or with all bed length options. The standard engine on the 2017 F-350 is a 6.2L gasoline V8 engine with 385 horsepower and 430 pound-feet of torque. Should you need more than that, you can upgrade to the optional 6.7L V8 turbo diesel engine, with its 440 horsepower and amazing 925 pound-feet of torque. Both of these engines are mated to a six-speed heavy-duty automatic transmission. Six airbags are standard on the 2017 F-350: two front seat front airbags, two front seat side airbags, and two side-curtain airbags. You also get a warning system for when seatbelts are not buckled, child tethers, and a post-crash alert system. The 2017 Ford Super Duty F-350 will take on any work-related challenge you can dish out, and it will come back for more! For an F-350 in Hawthorne, contact us today at South Bay Ford Commercial in Hawthorne for a test drive in this outstanding heavy-duty pickup truck!